Valves and filters form an essential part of any process plant or system in a wide range of applications from relatively simple on/off functions to flow control, pressure relief and filtering. All wetted parts of valves and fitters described in this section of the catalogue are constructed from borosilicate glass, PTFE, Ceramic, FEP, PFA or tantalum thus ensuring maximum resistance to corrosion. 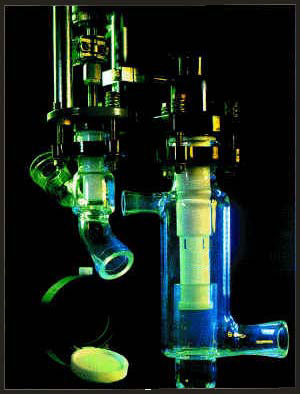 In addition, as valves have a glass body, visual monitoring of the valve operation is possible at all times. For standard flat Buttress end connections from DN 25 to DN 150, it is possible to achieve a 3 deflection in the joint by using a flexible gasket. Details of these and all other couplings and gasket can be found in section -Couplings. The valves described in this section of the catalogue comply, which means that 90° bends, tee pieces and equal crosses (see section – Pipeline Components) are interchangeable with certain type such as angle valve. For permissible operating conditions, Unless otherwise stated in the individual description, please see section –Technical Information. Generally, the maximum operating temperature for valves is 200°C but temperature above ambient, particularly in the range from 120°C to 200°C, impose restrictions on the permissible operating pressure. A wide variety of valves are available for a range of purposes. All have borosilicate glass bodies. As a result operation of the valve can be checked visually. In practically every case glass is combined with PTFE, which ensures that the valves have maximum resistance to corrosion. All the valves are suitable for use under full vacuum. Pressure ratings at ambient temperature are indicated in the tables applicable to each type of valve. The maximum operating temperature is 200° C but temperatures above ambient particularly in the range 120° C to 200° C, impose restrictions on the permissible operating pressure. In case of doubt it is advisable to consult us. These valves comply with ISO 3587 where applicable. Thus maximum interchangeability of compatible components is assured. For example, angle valves can be interchanged with 90 ells, equal tee pieces and equal crosses. DN refers to nominal bore. Unless otherwise stated dimensions are in millimeters. Figures given for maximum recommended working pressure represent pressure above atmospheric.